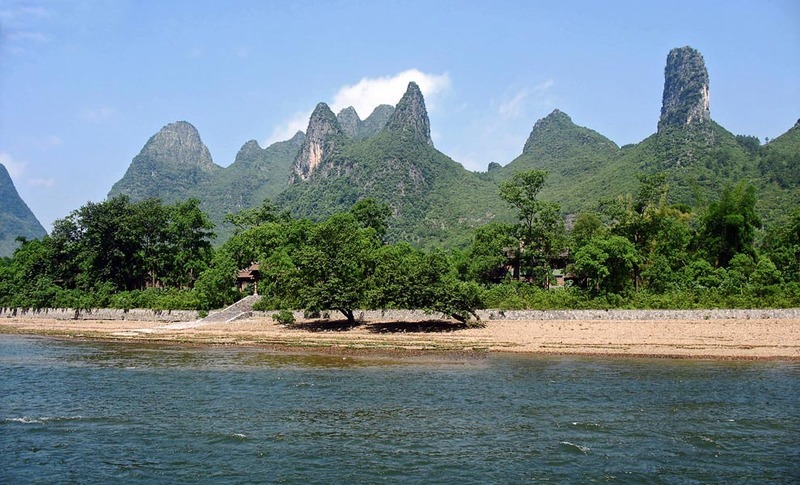 The Li or Lijiang River in Guangxi Zhuang in China winds through peculiar shaped mountains or perhaps you can call them hills, the kind you have never seen before. They are like cones or tubes or in some cases like sand dunes! The cruise along the Li River is popular with tourists. These green hills make a very picturesque sight. Here is a small boat laden with tourists winding its way along the Li River. The green rocky cone shaped hills are in the background. Some of the hills are like pointed cones. Trees line the narrow beach along the river Li. Some of these rocky hills have been given different names in Chinese because of their weird shapes. 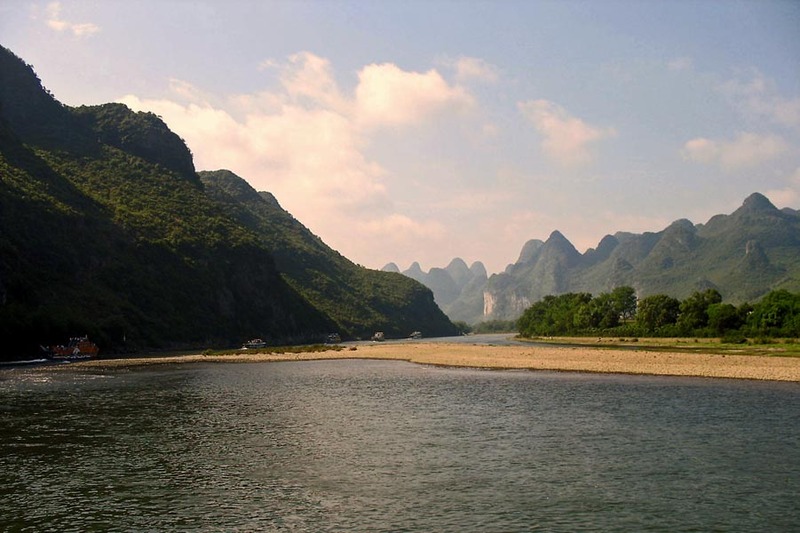 A long shot of the Li river. The river, the beach, the boat and the hills. 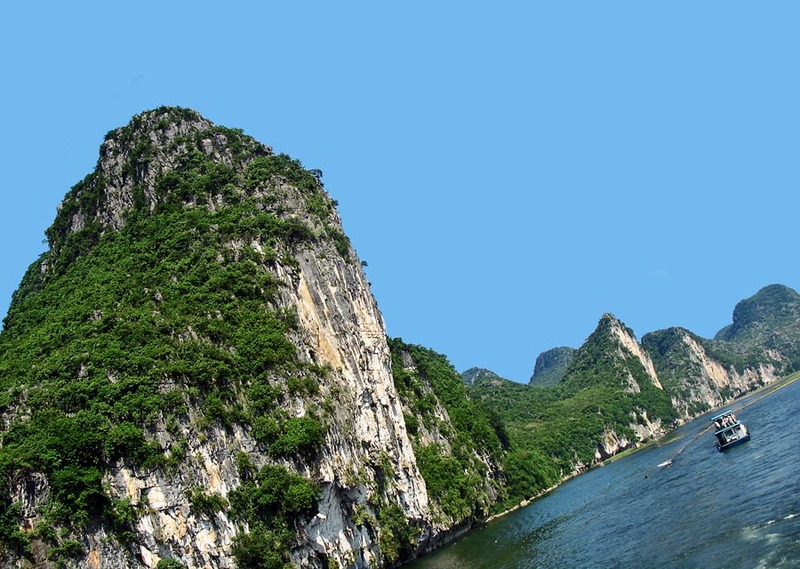 You might also like to see pictures of other interesting sights of Guilin like the Elephant Rock in Guilin China or the Reed Flute Cave at Guilin, China, both of which are natural formations. Or more photographs of Nature scenes or beautiful Scenery. Or pics of China, including those of its cities, its people, and monuments.